Last night my friends I received an unsolicitation. You know, an unsolicited compliment. You know which coat she was talking about right? My Simplicity 2311 of course. Needless to say I was pretty happy to hear that. I graciously thanked her and flushed with pride. I did not find it necessary to say that I made it myself. It was enough to know that a fashionable and gorgeous twenty-something thought my coat was stylish and beautiful. This entry was posted in Coats, Sewing. Bookmark the permalink. Congratulations! I’m not surprised you received a compliment on your coat – you look fabulous in it. I’m sure that you’ll be receiving many more compliments! What a wonderful way to end a long hard day! Absolutely! It really is a great coat, you did do an awesome job and the colour suits you. HOW did you resist? I would have had to tell her I’d made it myself. Whilst dancing on the counter with joy. Well done, you! I would of had to say that it was homemade too . I do love the shape of your coat and the colour IS fabulous on you . You should be “flushed with Pride”. 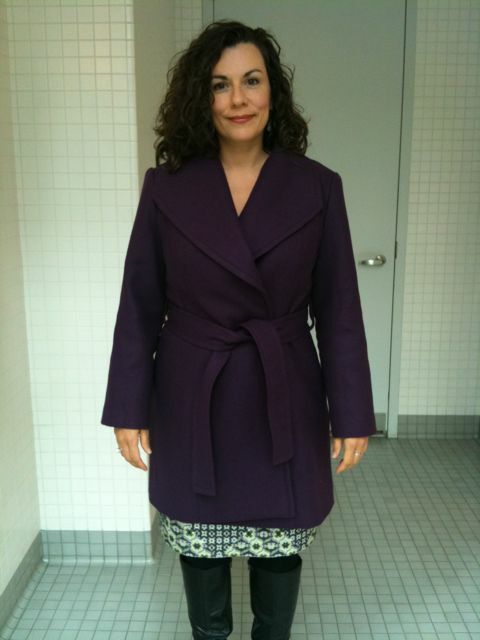 The coat is stylish and well made (RTW). You wear it well. Congrats!! You deserve it – that is one fabulous coat!! I can never decide when I’m complimented on something I made if I should reveal it’s origins or not. I think in this scenario I’d have gone with “not” as well, unless she asked where I got it. Love it when someone who doesn’t know I sew compliments a piece! Enjoy the high. You totally deserve that compliment and should glow with pride all winter long! I love your term “unsolicitation” and you totally deserve that compliment. Congratulations on the complement! Not only does it mean that the coat is stylish but it also means that it doesn’t look “home sewn” if you know what I mean. How nice! Well, it does look great on you! You deserved it… your coat is gorgeous.. Your compliment was well deserved! Yes, and you deserve it with that coat. You have totally convinced me that I need to make this coat – as they say, “imitation is the sincerest form of flattery.” So there’s ANOTHER compliment for you, if you needed one. Definitely! That IS a fantastic coat and color on you!